At the end of last week’s post, I pointed out that while breaking down aggregate global energy use by source starts to give us a more nuanced view of what it takes to enable our collective economic activity in physical terms, this still treats humanity as a single “giga-individual”. We’ll have a much better sense of the global picture if we look at how the collective view is made up in terms of energy use distribution across different groups of individuals. This is the contextual dimension that we’ll focus on in this post. For a raft of practical reasons, the default institutional basis on which we humans tend to differentiate ourselves from one another at the global scale is by nation. Usually this passes without remark—so much so, that it perhaps seems entirely natural to start the process of dividing up global aggregate energy use on this basis. I’ll certainly be following this convention—both because the data that’s readily available for this purpose is organised along national divisions, and because this is a straightforward way to ensure that the discussion is readily accessible to you, the reader. We’re used to doing things this way, so it makes interpretation relatively straight forward, and allows us to compare the picture that’s presented with our existing understandings of the world. Even so, given the systemic nature of our inquiry, it bears highlighting that this is in fact a matter of convention, rather than a necessary way of going about the collection, analysis and presentation of statistical data. Though it may well be a matter of present practical necessity—i.e. the only practical basis on which we could manage to build up globe-spanning pictures of what is going on within our present institutional reality—as we proceed, it may be worth keeping in mind the question of how landscape features might be both revealed and concealed by this approach. I’ll discuss some particular considerations relating to this as we go, but the matter has general relevance. To tie this in with a major theme overall for Beyond this Brief Anomaly, and one that we’ve been attending to in particular detail the past couple of weeks, dividing energy use up by nation, while it adds very important contextual nuance, is still very much a matter of working with high-level abstractions. This is built-in to the business of thinking in global terms—whenever we do this, we’re dealing with phenomena beyond the reach of our own senses, and our own direct experience. The means we have for doing this is via the mediation of conceptual—and hence language-based—frameworks that we create and share with others. By formalising these frameworks—for instance, by agreeing on national boundaries as the default basis for collecting demographic, economic and resource data—we provide ourselves with a powerful basis on which to build shared understanding, and in doing so, to become a global “we”. To get us started, Figure 1 below presents per capita primary energy use for a selection of countries spanning most of the range from highest to lowest energy use (click on each figure for a higher-resolution view). The chart shows World Bank data for 2007, which is based in turn on IEA data for each country’s aggregate energy use. I’ve presented 2007 figures because this is the most recent year for which sufficiently comprehensive data was available for both OECD and non-OECD countries i.e. for countries spanning the full range of humanity’s life conditions. The numbers range from a little over 8000 kgoe per capita for Canada, way down to Timor-Leste (a.k.a. East Timor) at just under 60 kgoe per capita, an attention-grabbing 140-fold difference. [Note 1] At the low end, East Timor has close to the world’s lowest per capita primary energy use, at least amongst those countries for which published data is available for the reference year. There are several outlier countries at the top end i.e. 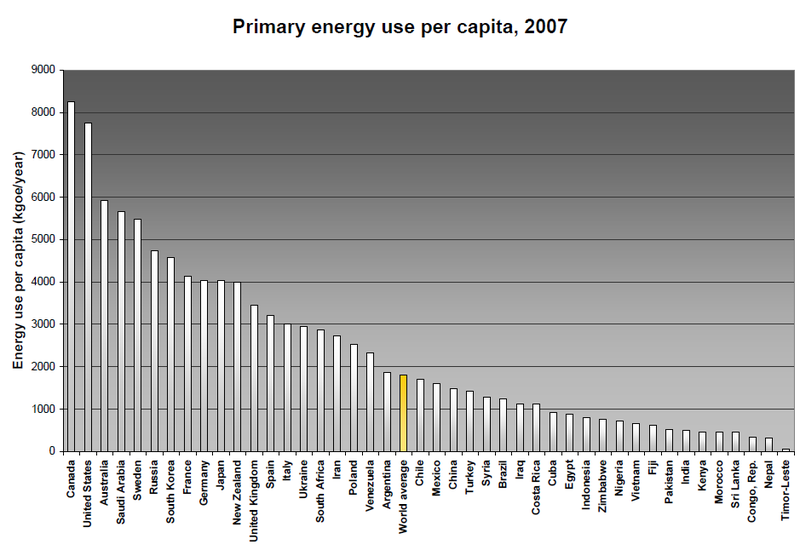 with per capita energy use higher (in some cases much higher) than that of Canada. These include Qatar, Trinidad and Tobago, Iceland, a number of Middle Eastern oil exporting countries, Brunei and Luxembourg. The circumstances for most of these outliers are sufficiently unusual that they don’t really add much to the overall picture of global energy wealth—most have very small populations (less than 1.7 million), or, in the case of Kuwait and United Arab Emirates, relatively small populations but very large oil resources, skewing the per capita figures relative to most other countries. Nonetheless, these cases are worth mentioning, if only in terms of noting that the absolute range of per capita energy use is much greater, even on a national basis, than Figure 1 indicates. I’ll return to the matter of what might be hidden by the averaging process shortly. For reference, Figure 1 also shows the world average per capita primary energy use of 1808 kgoe, or 76 GJ. The chart of course doesn’t tell us anything about the proportions of the world’s population that lie to the left and right of the average. These figures are perhaps the most telling in terms of the distribution of energy wealth, and in this respect they are rather stark: in 2007, 1.58 billion people (24 percent) accessed more than the world average, while 5.05 billion (76 percent) accessed less than this. In other words, for the world’s entire human family to enjoy equal access to primary energy sources, one quarter of us would have access to less energy wealth than at present, while three quarters would experience an increase. I just offer this as a thought experiment—I’m not suggesting that such redistribution is literally possible, in the sense of shipping energy resources from rich countries to poorer countries. There’s certainly a whole raft of political-economic and cultural considerations that would militate against such an initiative, whether or not it’s regarded as desirable. As a very general way of thinking about the nature of global energy wealth distribution though, it perhaps provides some valuable pause for thought. Figure 1 tells only a partial story though. For starters, averaging energy wealth across national populations hides significant variations within those populations, following to some extent at least the distribution of financial wealth. It’s widely acknowledged, and quite uncontroversial, that greater financial wealth tends strongly to correspond with greater consumption of goods and services, and hence greater energy use. While this need not necessarily be the case for individuals—there are plenty of rich but frugal people who demonstrate that this is not a matter of simple causality—it’s certainly what we observe on average over populations. So countries that are less equal in terms of both private and public financial wealth distribution are also likely to be less equal in terms of energy wealth. In keeping with the discussion above of outlier countries that show how the range of variation increases as we look at groups of people in finer detail, its worth considering this in terms of other groupings, as we do for instance when we differentiate between groups on the basis of socio-economic indicators such as financial wealth or access to public services and infrastructure. In energy terms, however, the situation is not quite as straightforward as it might at first seem. This difference is related to the limited proportion of per capita energy use that can be linked directly to any individual’s activity. In this context, it’s useful to think of overall energy use in terms of variable and fixed components. For a given set of expectations in terms of direct end-use energy availability at the household level, and availability of goods and services enabled by others’ energy use, there are relatively inelastic energy overheads that must be covered. These overheads must be born more-or-less evenly by every individual who wishes to access a given commercial energy source, or goods and services more generally, regardless of the actual quantities purchased. So for instance, whether I wish to use two kilowatt-hours or twenty kilowatt-hours of grid-distributed electricity per day, the same enabling infrastructures—both physical and institutional—must be present to allow this. Moreover, even as a relatively small user of goods and services, I may rely on economies of scale due to much higher average use in order for those goods and services to be available at prices I can afford. In this sense, my lower than average use really needs to be understood as systemically connected with others’ higher use—in a sense, “we’re all in it together.” This logic extends also to services that we might not use personally or access directly, but that are necessary for the functional organisation of societies in general. For instance, governments and the functions they provide, such as police and military forces, all entail significant energy overheads, an equal portion of which, it could be reasonably argued—at least in democracies—accrues to each citizen’s individual energy account. The net result of such considerations is that there is some base level of per capita primary energy that might best be regarded as fixed for each of a given country’s citizens, with the intra-country variation then being in relation to the remainder after the fixed component is allocated. I’ll try to give a sense of what this means in practical terms by looking at my family’s own household energy use in the context of Australia’s overall situation. Australia’s per capita primary energy use in 2007 was just under 6000 kgoe, according to World Bank figures (and a shade over 6500 kgoe based on the Australian Government’s own published data ). This is approximately 250 GJ, or three and one third times the world average. Of the 5770 PJ TPES and 3895 PJ TFC for Australia in 2006-7, though, only 992 PJ, or 47 GJ per person, was accounted for by final energy use at the household level—i.e. energy use in the form of direct consumption of electricity, natural gas and automotive fuel. So household energy use in 2007 was approximately 20 percent of TPES and 25 percent of TFC. Even if actual household energy use is significantly higher or lower than the average, there is only limited scope for variation relative to the national average per capita TPES. This is the situation in my own case. Our total household energy use, for two adults and two children, is approximately 38 GJ per year, compared with a national household average of 122 GJ per year for the average household size of 2.6 people, or 188 GJ per year for a four-person household. In our case, the four-person total of 38 GJ is comprised of approximately 9 GJ electricity, 12 GJ natural gas and 17 GJ petrol. Even if we were to take a credit for the difference in primary energy for electricity generation based on our actual electricity use relative to the average per capita household electricity use of 11 GJ per year (and assuming average source-to-socket efficiency for electricity supply of 25 percent), each family member would still only reduce his or her per capita share of TPES by a further 26 GJ, or three units of primary energy for every unit of electricity saved relative to the national per capita average. [Note 2] This would bring the total for each member of our family down to 250 – (47 – 38/4) – 26 = 187 GJ. With further savings relative to the national average in non-household use, e.g. air travel, consumption of food and other goods and services etc, it’s conceivable that we might reduce our per capita share of TPES by about half this amount again, bringing our total to something like 155 GJ per person, i.e. 60 to 65 percent of the average. This is in fact very close to the reduction that Tom Murphy has estimated for his own individual energy use situation, by looking in a little more detail at areas beyond the household. Converting my own family’s use back to units of kgoe, the estimated per capita energy use for each of our four family members is approximately 3700 kgoe, or a bit over double the world average. Tom’s more comprehensive estimate for his own share of primary energy use works out to 150 kWh/day, or a shade over 4700 kgoe. Most of the difference between Tom’s figure and mine reflects the different national contexts within which we’re living—for Tom, the USA with average per capita primary energy use of around 7500 kgoe, and for me, Australia with average per capita primary energy use of around 6000 kgoe. The implications of this for the sort of redistribution of energy wealth that I proposed as a thought experiment earlier are, I hope, clear: there is significant, but ultimately limited scope for approaching this—were we to treat is as sufficiently desirable to warrant action—via changes at the individual level. As long as my family is living in an energy-rich country, even by making significant efforts towards reduced personal energy use, the structurally-constrained lower bound on our commercial energy use rests well above the global parity level. The ways of life that we presently enjoy are systemically enabled by high per-capita energy use. So far, I’ve proceeded on the basis that energy wealth correlates positively with general human well-being (and moreover perhaps, with human lives well lived). There’s nothing in Figure 1 though to tell us about this, other than our own personal interpretations of what it might mean in such terms to be a citizen of East Timor on one hand, or Canada on the other. On what grounds might we in fact assess the desirability of greater equity in energy wealth? As it happens, we can marshal a range of widely-accepted human well-being indicators in support of the view that citizens of countries with higher per-capita primary energy use are generally better off than those of countries with lower per-capita use. Nonetheless, what we find when we look at the distribution of energy wealth in such a way is far from a story of “more is better”—this is not a simple linear relationship. Vaclav Smil, Distinguished Professor in the Faculty of Environment at the University of Manitoba, provides particularly insightful analysis in relation to this. In his book Energy at the Crossroads , Smil compares per-capita energy use with infant mortality, female life expectancy at birth, average per capita food availability, the United Nations Development Programme’s Human Development Index, and the Political Freedom Index, all based on national divisions using data for 2001. A summary of the findings, including charts for each indicator, are also included in a more recent book chapter available here. For each of these indicators, the data follows a similar general pattern: steep improvement with relatively modest increase in per capita primary energy use up to around the world average, at which point there’s an inflection in the relationship, after which further energy use correlates with far more modest gains only. Beyond a certain level of energy use, there appear to be no further gains, except in the case of food availability. This exception is particularly noteworthy, given the growing prevalence of diseases of consumption, such as obesity, in much of the rich world—it might very well be argued that on this measure, increasing energy use beyond a certain level in fact correlates with reduced well-being. For our purposes in this post, in considering how to most readily provide a sense of the relationship between energy wealth and human well-being, I’ve adopted the Human Development Index (HDI) as the default indicator. This shouldn’t pass without some commentary though: consistent with discussion in the post’s introduction, we’re dealing here with high levels of abstraction. As such, there’s a great deal of scope for differing views with respect to the merits of the various indicators that I might have used. A little further along, I’ll make mention of some of the alternatives, and how they might present a significantly different picture to that based on HDI. The pre-2011 HDI value for each country or region is a uniformly weighted sum of the indices for each dimension. While it’s the primary basis on with the UN classifies countries as developed, developing or under-developed, HDI is subject to a wide range of criticisms relating to its legitimacy as a quality of life measure. Of particular note, the HDI doesn’t include any consideration of the environmental impacts associated with a given living standard. As such, it suffers from the same perversity that afflicts GDP as a standalone measure of well-being: pursuit of economic development without regard for environmental costs shows up as a net positive. In other words, there’s no recognition that the health of the secondary economy of goods and services depends on the health of the primary economy of the non-human bio-physical world, and as such, that we’d perhaps do well to recognise the limits of that primary economy. Alternative indices do explicitly account for such considerations: for example, the Environmental Performance Index, a collaboration of Yale University, Columbia University and the World Economic Forum, and the New Economics Foundation’s Happy Planet Index. We’ll look at these alternative views in more detail a little further on. Keeping in mind the above caveats in relation to the very conventional notion of wealth on which this view is based, in Figure 2 I’ve presented the relationship between HDI and per capita primary energy use, for the countries included in Figure 1. The data on which this is based is again for 2007, the year for which the most comprehensive recent figures are available. Figure 2 presents a picture largely equivalent to Smil’s earlier version based on data from 2001. Nonetheless, there is a notable difference. Whereas Smil shows HDI reaching a plateau at around 7000 kgoe/year, the more recent data shows this being reached around 5500 kgoe/year, and even perhaps with some decline after that level of energy use. In fact, in 2007, the country ranked highest by HDI was Norway, at 0.94, and with per capita energy use just a little less than Australia’s. 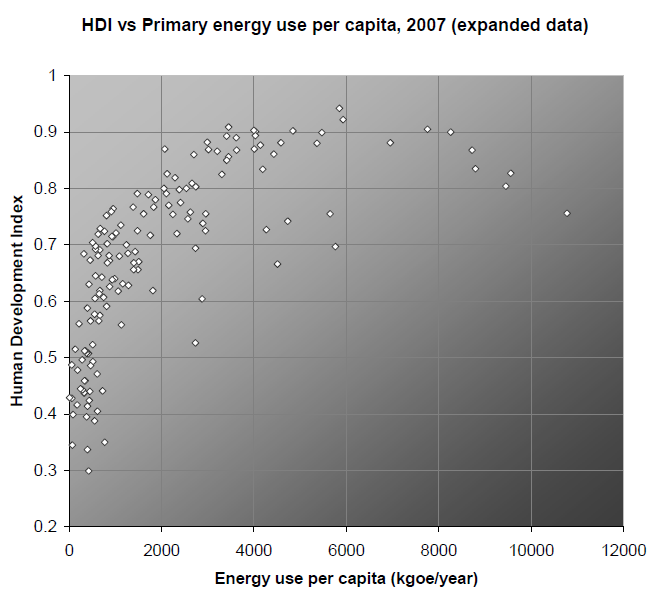 For comparison, in Figure 3 I’ve presented an expanded data set for HDI vs per capita primary energy use, showing all countries for which 2007 data was available for both dimensions. Figure 3 suggests more strongly that the relationship may in fact be better characterised now by a peak and decline in HDI with increased energy use. 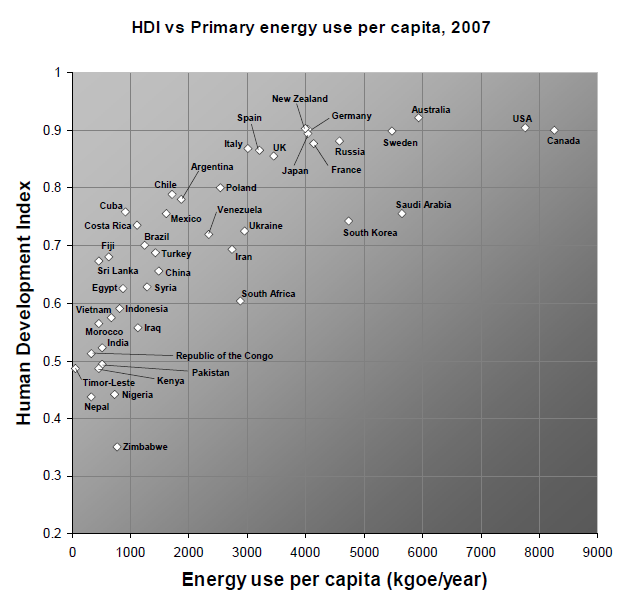 Figure 3: Human Development Index vs Per capita primary energy use (2007 data), data set expanded from Figure 2 to include all countries for which data was available for that year. Data sources as for Figure 2. In any case, Figures 2 and 3 clearly indicate that, to the extent we accept HDI as a legitimate and reliable statistical indicator of human well-being at the population scale, it’s possible to enjoy a quality of life in all practical respects equivalent to the highest available to any of us, with energy use well below the extremes of Canada, the USA and Australia. Switzerland and Ireland, with HDI scores of close to 0.9, each used just under 3500 kgoe/year per capita in 2007; and Israel, with an HDI score only a little lower at 0.88, used less than 3000 kgoe/year. Hong Kong—represented by the data point at the upper edge of the envelope bounding the points in Figure 3—with an HDI score of 0.87, but less than 2100 kgoe/year per capita energy use, suggests that the prospects for equity in global energy wealth may not be as far fetched as we might imagine based on the picture presented in Figure 1. A lesson from this is surely that “gross energy wealth” does not necessarily make for destiny in terms of life quality. In addition to these countries, there are many with a High human development score, but with per capita energy use a little higher than the world average; and a significant number with HDI scores in the upper region of the Medium range, and with energy use well below the world average. While the combined population of the countries in the table above is only 460 million people, or seven percent of the world total in 2007, China’s situation (1.3 billion people, or just under twenty percent of the world total) is also worth noting. With an HDI score of 0.656, it’s in the upper region of the Medium development range, yet its per capita primary energy use in 2007 remained below the world average at 1490 kgoe/year. Might these countries provide us with models of what a world characterised by equity in energy wealth could possibly look like? Might these countries give rich-world citizens some indication of what it could be like to live with less abundant energy wealth, as we head towards the down slope of the fossil fuel age? With these questions in mind, I’ll introduce data for three further indices by which we might differentiate between this group of countries on other dimensions of well-being, with a view to better appreciating the potential for lower-energy ways of life. As mentioned earlier, Smil also looked at the correlation between per capita energy use and the Political Freedom Index (Freedom in the World), compiled by Freedom House. I’ll use this as the basis for identifying significant differences between the countries listed in the table above, with the caveat that my own use of the Freedom House data in this context isn’t based on a critical appraisal of the political and cultural commitments underlying the index itself—i.e. in adopting it, I’m not suggesting that it’s necessarily a definitive basis for such assessment. The Freedom in the World rating for each country is presented in the table below, with ratings between 1.0-2.5 designated as “Free”, 3.5-5.0 designated “Partly Free”, and 5.5-7.0 designated “Not Free”. Just for comparision, I’ve also included data for China. Of the twenty-one countries (plus China), thirteen are rated as “Free”, with five of these—Chile, Barbados, Costa Rica, Uruguay and Dominica—achieving the maximum rating. Two—Cuba (and China)—are rated as “Not Free”. It’s apparent from this that relatively low per capita energy use is certainly no barrier to political freedom, at least as measured by this particular index. Earlier I mentioned the Environmental Performance Index (EPI) and the Happy Planet Index (HPI) as two measures of well-being that explicitly account for environmental impacts associated with a country’s economic activity. The EPI is specifically focused on the assessment of environmental health and ecosystem vitality. It incorporates twenty-five separate indicators across ten categories and sub-categories related to land, water, atmospheric, natural resource, biodiversity and disease impacts. The HPI is essentially an index of the environmental efficiency of providing human well-being. It’s comprised of measures for life satisfaction, life expectancy and ecological footprint. Country rankings (where available)—rather than the raw scores—are presented for each index in the table below, alongside the political freedom rating. The HPI data is available for 2006 and 2009, and so I’ve presented rankings for both years—in many cases the changes in ranking are very large, and so comparing both rankings may provide a better picture of a given country’s situation. It’s noteworthy that Central American, Caribbean and South American countries feature so prominently overall in this group. When environmental performance and the environmental efficiency of well-being are taken into account as well, one country, Costa Rica, stands out markedly from the others. On this basis, Costa Rica may well provide a worthwhile case study in relation to the exploratory futures questions posed earlier. Brazil is also worth highlighting in this context, particularly given its large population. While I won’t pursue such case studies further at this stage, there is one further dimension that bears consideration in thinking generally about the question of energy wealth and its distribution. So far, in considering per capita primary energy use, we haven’t brought in any of last week’s considerations relating to the differentiation between sources. Particularly in the context of the ultimately finite nature of fossil fuels, this has important implications for comparing the relative wealth of nations. 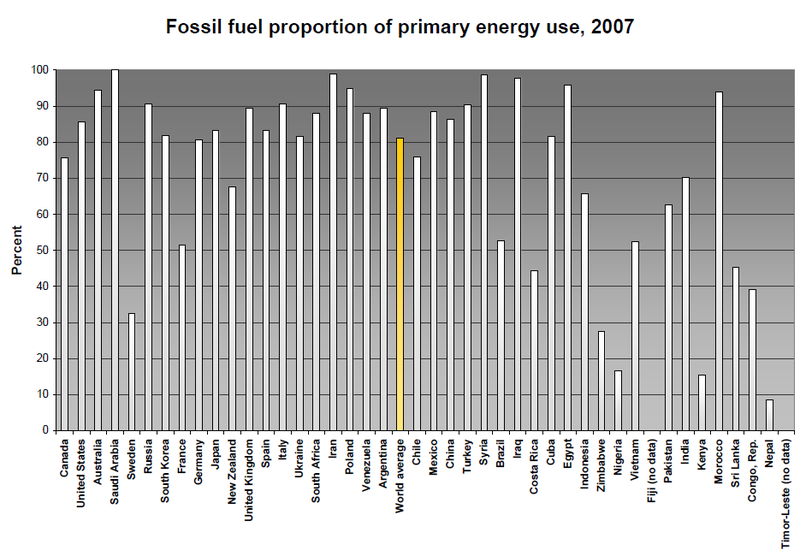 In Figure 4, I’ve approached this question by presenting the fossil fuel proportion of primary energy use in 2007, for the original cross-section of countries included in Figure 1. This provides a rough indication of the extent to which each country is dependent on fossil fuels, and hence of the extent to which energy wealth is subject to depletion over time. In interpreting this data, it’s important to keep in mind the discussion last week relating to the role of transport in the global economy, and transport’s almost complete dependence on fuels derived from oil—a relatively low dependence on fossil fuels overall needs to be considered in this context. Even with relatively low fossil fuel dependence overall, all economic activity in industrialised countries is strongly dependent on oil by virtue of transport dependence. Remove oil from the picture, and all mechanised transport stops; stop all mechanised transport, and all economic activity grinds to a halt. Keeping this in mind, an inspection of Figure 4 reveals a couple of interesting features. Firstly, there’s a very rough trend of reducing fossil fuel share from countries with higher per capita energy use compared to those with lower per capita use. In other words, the share of fossil fuels in the overall primary energy mix for countries with lower energy wealth tends to be lower than that for countries with higher energy wealth, although there’s considerable variation between countries. Of the high energy use countries, Sweden, France and New Zealand stand out as having relatively low proportions of fossil fuel. For Sweden and France this is due to high reliance on nuclear energy for electricity generation—this presents long term challenges in its own right, owing to the ultimately finite nature of uranium resources, and the diminishing return on energy investment as ore grades reduce. New Zealand’s lower proportion of fossil fuels is due to a high proportion of hydroelectricity. At the far right of the chart, Nepal’s primary energy is dominated by waste and biomass, such as wood fuel—which, while nominally renewable, is subject to biophysical limits in terms of replenishment rates, and depletion of soil nutrients. Costa Rica and Brazil again stand out here. Brazil’s situation is related to its very high use of biofuels derived from sugar cane for transport. Brazil is one of the very few countries where non-fossil transport fuels do in fact make a significant impact, and so Brazil in this sense presents once again a very interesting case study for the exploratory futures questions posed earlier. Costa Rica’s situation is due especially to a very high proportion of renewably generated electricity—a combination of hydro, geothermal and wind electricity generation is used to produce ninety percent of the country’s electricity supply. This is not a matter of painting Costa Rica, Brazil or any of the other countries in the low per-capita energy use—High HDI group in a utopian light. On the other hand, the highly non-linear relationships between energy use and human well-being certainly suggests that there is ample opportunity for us to question the conventional view of energy wealth presented in Figure 1. While energy wealth considered in abstract terms of “joules available per capita” is certainly distributed very unevenly, the distribution of human well-being follows a somewhat different pattern. There are clearly grounds for questioning whether per capita energy use as high as that enjoyed in Australia and other rich nations is indeed quite as beneficial as it seems. And as we’ve seen, there is much scope for reducing energy use without necessarily compromising quality of life. Even so, implementing such changes, were we to approach them as a matter of collective choice rather than having them imposed on us by circumstance, would require decisive collective action. As we proceed with the inquiry, we’ll have further opportunities to consider the prospects for structural changes of that nature. In the next post I’ll take up the story of fossil fuels in more detail, with a view to developing a better sense of just how remarkable they are as energy sources. Fossil fuels get a bad rap in many quarters today. I’ll aim to paint them in a more appreciative light. Given the role they’ve played—and continue to play—in enabling the benefits of industrialisation, they surely deserve this. Note 1: I’m not sure how accurate the World Bank figure is for East Timor. Based on figures from the CIA World Factbook, and aggregating electricity production from 2008 with oil consumption for 2010, I make out East Timor’s per capita energy use to be over 100 kgoe, without making any additional allowance for the electricity’s primary energy source. In any case, this would still place it amongst the countries with the very lowest per capita primary energy use, according to the World Bank data. Note 2: For every unit of electrical energy delivered to the home, approximately four units of primary energy are used at the electricity generation plant. This assumes that the bulk of the electricity fed into the supply system is generated thermally from coal combustion i.e. by burning coal to convert heat to work, as is the case both for Australia and the world in general. I could claim a further credit for the fact that my family purchases one hundred percent wind generated electricity. However, this involves feeding a relatively small quantity of wind generated electricity into a supply system that is predominantly distributing electricity derived from burning coal. Given that the supply infrastructure for our electricity is still entirely dependent on coal-fired electricity, I’ll recognise this in my calculation by wearing the primary energy overhead equivalent to the actual final quantity of electricity that we do use at home. Australia’s TPES in 2006-7 was 5770 PJ, from Energy in Australia 2009; Australia’s population at 31 December 2007 was 21,180,632, according to ABS data. Smil, Vaclav (2003), Energy at the Crossroads: Global Perspectives and Uncertainties, MIT Press, Cambridge. This entry was posted in Global energy supply and use and tagged energy equity, Environmental Performance Index, fossil fuels, Happy Planet Index, Human Development Index, per capita energy use, wealth by Josh Floyd. Bookmark the permalink.